One of the most effective and popular ways of selling is through classifieds in local newspaper advertising. Most readers find this section trustworthy, as they turn to the section when seeking jobs, services, and products. Classified ads are short blocks that allow for about 20 words, explaining a product or service for a customer. Since there are many ads on these pages, you need to find ways to ensure your ad catches your readers’ eyes. 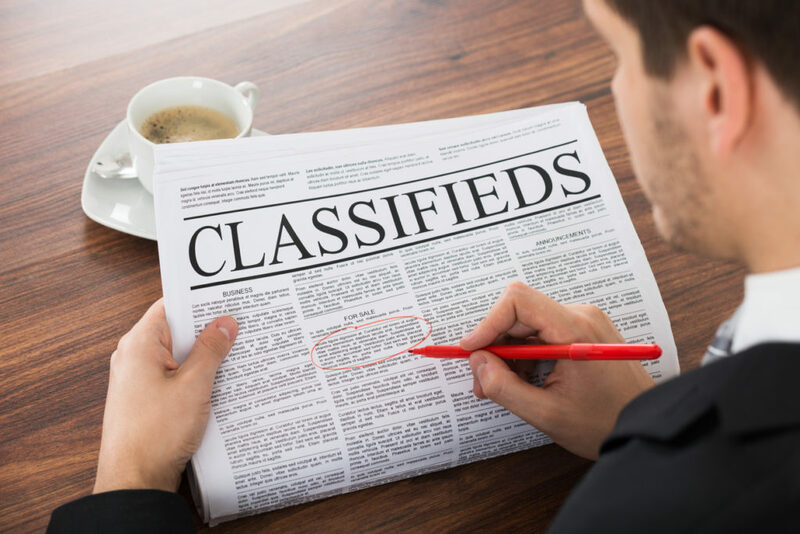 Here are some helpful tips to make your classified newspaper advertisements appealing. Making sure your ad reaches you target audience is extremely important. General newspapers may offer you a wide variety of potential buyers, but you may want your ad to be placed in a niche publication to ensure it attracts the right prospects. Since print media advertising can be expensive, you need to be very careful about the decisions you make. Working with a marketing agency can help you gain wisdom and insight to create and publish effective newspaper ads. Choosing the right publications will save you money and prevent you from wasting your time and energy on newspapers that don’t work for your ads. Some newspapers and magazines are read by your target audience, and these are the ones you should use. You also need to consider the geographical range of your audience. Does your business offer services in the entire state or just in a specific region? It makes no sense to invest significant amounts to posting your ad in a state-wide publication, when only a small selection of that audience can buy from your store or access your services. Looking carefully at your competitors will determine what kind of language they use and how they promote their offers. For the competitors that have been successful, this information can help you form your own ads. If certain words or features appeal to customers, determine how you can incorporate these ideas into your own ad. How large is the classified section? What is the cost to post an ad here in the publication you are using? What categories would your ad appear in? Do you need to pay by word or line? Are bold headlines, caps lock, colour, and borders allowed? Your headline is the first thing your customers will see when they look at your ad, unless you also include a graphic. Creating your headline will take some deep thought. You can begin by listing the benefits of your product or service and narrowing down the one that has the best chances of getting the attention of your prospects. Then, incorporate this benefit into your headline. Your headline should focus on how you are meeting a need or solving a problem for your prospects. Shorter and concise headlines work best. Also, use a larger font, if possible, to grab your readers’ attention. After you’ve developed your headline, it’s time to write your message. Your message needs to quickly explain to your readers what your offer is and how you solve a problem for them. Your readers’ attention spans are short, so if you take too long with anecdotes and fluff, you risk losing a lead. Before you can publish your ad, consider how many words you can afford. If this is your first ad, you may want to test your ad with 20 words instead of 30. Three lines may be more effective than four. Once you know your budget and the specific requirements of your desired publication, you will be on your way to creating the right ad. A strong call to action persuades your reader to follow up with your ad by calling for more information, visiting your web site to shop your items, or going to your physical store to redeem a coupon and buy items. When a prospect knows where to go to respond to your advertisement in a newspaper, you create a direct line that turns a reader into a customer. Whether you’re focusing on a local audience or a large one, your ad needs to include your contact information. It makes no sense to get them excited about your product or service, only to leave them hanging without a way to get in touch with you. Use words from your call to action to lead into your contact information. Phrases like “Call Now,” “E-mail Resume To,” and “Visit Us At” will lead your prospects to you. If you are launching a marketing campaign for the first time, starting off on the right foot is likely your goal. Print media marketing offers many benefits and advantages to new and established businesses, and can work in connection with your digital marketing. With the right guidance and support, you can create ads that connect with your customers and entice them to visit your web site, call you, or shop at your store. If you’re planning to use print advertising to reach your customers, working with our reputable marketing agency will be very useful. At Macromark, we specialize in helping our clients create strong, effective, successful newspaper and print ad campaigns. Our variety of services can be customized to suit your business goals, and we have packages that can work with a range of budgets. No matter the size of your organization, we can help you target your audience, retain customers, and build your reputation among your audience as a company they can trust. Our services also include direct mail marketing, list brokerage, data solutions, list fulfillment, and list management. For more information about how we can help grow your business, contact us at 1-(845)-230-6300.